Objective Despite the short-term and long-term health implications of gestational diabetes mellitus (GDM), opinions are divided on selective vis-à-vis universal screening. We validated the accuracy of screening tests for GDM. Research design and methods Pregnant women (n=491) were recruited to this prospective, blind comparison with a gold standard study. We did selective screening between 13 and 20 weeks using reagent-strip glycosuria, random capillary blood glucose (RBG) and the presence of ≥1 risk factor(s). Between 20 and 34 weeks, we did universal screening following the ‘one-step’ approach using glycated hemoglobin (HbA1c), fasting venous plasma glucose (FPG), and the 1-hour and the ‘gold standard’ 2-hour oral glucose tolerance test (OGTT). Tests accuracy was estimated following the WHO and the National Institute for Health and Care Excellence (NICE) diagnostic criteria. Overall test performance was determined from the area under the receiver operating characteristic curve (AUC). Results GDM prevalence per 2-hour OGTT was 9.0% for the WHO criteria and 14.3% for the NICE criteria. Selective screening using glycosuria, RBG and risk factors missed 97.4%, 87.2% and 45.7% of cases, respectively. FPG threshold ≥5.1 mmol/L had the highest clinically relevant sensitivity (68%) and specificity (81%), but FPG threshold ≥5.6 mmol/L had higher positive predictive value. Although sensitivity of 1-hour OGTT was 39.5%, it had the highest accuracy and diagnostic OR. Regarding test performance, 1-hour OGTT and FPG were very good (AUC>0.8), RBG was poor (AUC≈0.60), whereas HbA1c was invaluable (AUC<0.5). Conclusions Selective screening using glycosuria and random blood glucose is unnecessary due to its low sensitivity. Fasting glucose ≥5.1 mmol/L could be applicable for screening at the population level. Where 2-hour OGTT is not available, FPG ≥5.6 mmol/L, complemented by the presence of risk factors, could be useful in making therapeutic decision. Despite recent updates on the diagnostic criteria for gestational diabetes mellitus (GDM), opinions are divided on the need for selective screening using risk factors, glycosuria and random blood glucose. The presence of risk factors was more sensitive compared with glycosuria, random blood glucose and glycated hemoglobin, which were highly insensitive and diagnostically poor, and hence missed majority of the cases. Fasting plasma glucose threshold ≥5.1 mmol/L was more sensitive than values ≥5.6 mmol/L. Findings reaffirm the rising prevalence of GDM and highlight the need to integrate fasting blood glucose monitoring into all GDM screening/diagnostic procedures. When deciding to treat, the presence of risk factors could be complementary to fasting plasma glucose, particularly where oral glucose tolerance test is not available. Gestational diabetes mellitus (GDM), a form of pregnancy-specific glucose intolerance, has been identified as the most prevalent metabolic disorder in pregnancy. The condition is associated with adverse maternal, fetal and neonatal outcomes,1 2 and increases the risk of type II diabetes in mother–child dyads in later years.3 In 2013, the global prevalence of hyperglycemia in pregnancy in women aged 20–49 years was 17%. Over 90% of cases occurred in low-income and middle-income countries.4 In Africa, the prevalence of hyperglycemia in pregnancy has considerably increased from negligible levels to almost 30% in some settings within the past four decades.5–7 The rising prevalence of hyperglycemia has been attributed to epidemiologic transition associated with increasing type II diabetes mellitus, unhealthy dietary habits, obesity, physical inactivity, and advanced maternal age at childbirth.3 8 However, consideration of gross variations in screening and diagnostic procedures and the reference thresholds used is necessary when interpreting these trends. Screening here denotes the scheduled measurement of blood glucose in all pregnant women whether asymptomatic or symptomatic, and whether ‘at risk’ or not, followed by diagnostic testing in screen-positive clients. However, the specific screening procedures and outcomes that should provide indication to conduct a diagnostic test are still controversial.9–11 Despite recent establishment of diagnostic criteria by various health regulating bodies, opinions are divided on selective versus universal screening. Selective screening, sometimes known as routine screening, is where only pregnant women identified from screening procedures to be at high risk for GDM are requested to perform diagnostic test to evaluate their actual glycemic status. Conversely, universal screening is where all pregnant women irrespective of their glycemic status perform a recommended diagnostic test to assess their likelihood for developing GDM. In line with evidence from the hyperglycemia and adverse pregnancy outcome study,1 and the recommendations from the International Association of Diabetes and Pregnancy Study Group (IADPSG),12 the WHO updated its clinical guidelines for detecting hyperglycemia in pregnancy in 2013.10 Similarly, the American Diabetes Association (ADA) updated its guidelines in 2015 in accordance with the recommendations of the IADPSG.11 The WHO recommends one-step diagnosing of GDM using fasting plasma glucose (FPG) ≥5.1 mmol/L or 75 g oral glucose intake, followed by 1-hour postprandial glucose ≥10.0 mmol/L. However, 2-hour oral glucose tolerance test (OGTT) ≥8.5 mmol/L performed at any time during pregnancy but preferably between 24 and 28 weeks is highly recommended. On the other hand, the National Institute for Health and Care Excellence (NICE) considers 2-hour 75 g OGTT performed between 24 and 28 weeks as the ‘gold standard’. Compared with the current WHO/IADPSG/ADA guidelines, NICE’s diagnostic threshold for 2-hour OGTT is 0.7 mmol/L lower (≥7.8 mmol/L), whereas the FPG threshold is 0.5 mmol/L higher (≥5.6 mmol/L).9 Meanwhile, the 1999 WHO diagnostic criteria for FPG was ≥7.0 mmol/L, whereas the 2-hour OGTT was ≥7.8 mmol/L, same as the current NICE guideline. Even though this paper focuses on GDM, it is worth noting that the WHO/IADPSG recommend random plasma glucose or 2-hour OGTT ≥11.1 mmol/L at any time during pregnancy as suggestive of clinical (pre-existing) diabetes.10 13 In this paper, the WHO, IADPSG and ADA diagnostic recommendations are collectively denoted as the WHO criteria. Urinalysis through reagent-strip glycosuria is not without challenges. During pregnancy, the renal threshold for glomerular glucose reabsorption is reduced, leading to increased glycosuria at some point in about 50% of all pregnancies.17 However, hyperglycemia without detectable glycosuria is not unlikely.18 Although dipstick glycosuria test is cheap and convenient, we suspect that its usage as the main routine screening test is resulting in missed (false negative) opportunities for diagnosis and management. Therefore, this diagnostic accuracy study was conducted to compare the prevalence of GDM in primary and secondary healthcare settings in Ghana using the current WHO and NICE diagnostic criteria. We validated the performance of dipstick glycosuria, random capillary whole blood glucose (RBG) and the presence of risk factors as screening tests for accurately detecting GDM. Outcomes were validated against fasting venous plasma glucose (FPG), glycated hemoglobin (HbA1c), and postprandial 1-hour and 2-hour OGTT considered as the diagnostic tests. The effectiveness of universal and selective screening approaches was assessed. Finally, cut-off points that optimized sensitivity and specificity were suggested from the coordinates of the receiver operating characteristic (ROC) curve. This diagnostic accuracy study, reported according to the Standards for Reporting Diagnostic Accuracy guidelines,19 was designed as a prospective, blind comparison with a gold standard study. This design compares the diagnostic accuracy of different tests in the same individual. This study is part of a prospective cohort study aimed at assessing the effects of hyperglycemia in pregnancy on maternal, fetal and neonatal outcomes. The index screening tests assessed were dipstick glycosuria test, RBG and maternal risk factors. One-hour OGTT and HbA1c were the index diagnostic tests evaluated. Performance of each test within the same individual was validated against 2-hour OGTT and FPG. The study was conducted at the antenatal clinics of one primary-level and four secondary-level public healthcare facilities in the Volta Region of Ghana. Forty-seven percent (516 461) of the 1 098 854 women in the region are in their reproductive ages (15–49 years).20 ANC and delivery services are provided predominantly in secondary-level hospitals in Ghana. Hence although the study was performed predominantly in secondary care settings, it was designed to replicate results that would have been achieved at all healthcare levels. The largest of the secondary facilities was the Volta Regional Hospital, a 240-bed capacity regional referral hospital in the process of upgrade to a university teaching hospital. The other three facilities were district hospitals. These included the Hohoe Municipal Hospital with a bed capacity of 178, Margret Marquart Catholic Hospital with a bed capacity of 152 and the Ho Municipal Hospital with a bed capacity of 130. The Jasikan District Hospital, a 45-bed capacity facility, represented maternal healthcare provision at the primary level. Cochran’s formula,21 which accounts for finite population corrections, was used to determine the minimum sample size required. We considered 9.3% reported prevalence of GDM in Ghana16 and a total target population of 516 46120 women in their reproductive age in the region. A 95% confidence level corresponding to 1.96 Z-score and a 5% permitted error margin generated a sample size of 130. The primary and secondary facilities were each treated as separate clusters. To account for variability of health service provision at each level, the effect of clustering was adjusted for, ensuring maximized statistical accuracy of GDM estimate that is nationally representative. Aided by the G*Power software (V.3.1.9.2),22 a design effect of 3.2 was determined based on a two-tailed t-test statistic with an alpha error probability of 0.05, 1-β error probability of 0.95 and an intracluster correlation of 0.16 derived from 0.03 coefficient of determination. The sample size was multiplied by the design effect, resulting in an effective sample size of 416. An a priori statistical power analysis yielded 91%, an indication that the sample size was adequately powered. Participant recruitment from the primary and secondary facilities was done proportional to size in the ratio of 1:6. Irrespective of the presence or absence of GDM risk factors, any pregnant woman aged 15 years and above identified in the first trimester accessing ANC in any of the five study facilities between June and November 2016 and who provided written consent was eligible to participate. However, pregnant women with prior diabetes, identified either from the medical records or self-affirmed, were excluded. Every consecutive pregnant woman who met the inclusion criteria was recruited until the required sample size was attained. Maternal risks factors were assessed from the sociodemographic data collected, as well as medical and obstetric history. Women with three or more known risk factors (maternal age above 35 years, body mass index above 29.9 kg/m2, parity above three children, history of diabetes and previous macrosomia delivery) were regarded to be at high risk for GDM. The one-step strategy recommended by the IADPSG for diagnosing GDM was followed.12 Glycosuria, RBG and risk factors were considered as screening tests, whereas FPG, HbA1c, and 1-hour OGTT were diagnostic. These tests were all evaluated with reference to the 2-hour OGTT. After drawing the preprandial blood, participants were supervised to drink within 3 min 75 g anhydrous glucose dissolved in 300 mL of water at room temperature. Postprandial venous blood was collected at 1-hour and 2-hour intervals and plasma glucose levels checked following similar biochemical procedure as for the FPG. As per the WHO diagnostic criteria, 1-hour OGTT ≥10.0 mmol/L and 2-hour OGTT ≥8.5 mmol/L10 were indicative of GDM. Also, as per the NICE diagnostic criteria, 2-hour OGTT ≥7.8 mmol/L was indicative of GDM.11 Test quality was ensured by running controls after every 20th test and/or on the morning of each test day as the case might be. Where thresholds for two out of these four tests were obtained (RBG ≥11.1 mmol/L, 2-hour OGTT ≥11.1 mmol/L, HbA1c ≥6.5% or FPG ≥5.6 mmol/L), it was considered to be a case of pre-existing diabetes first detected in pregnancy. The data were entered into EpiData software and exported into STATA software (V.14.0) for analysis. All missing inputs for FPG and 2-hour OGTT were automatically excluded from the analysis. Dichotomous outcomes indicating positive or negative disease state were assigned to each screening and diagnostic test. Differences among primary and secondary facility users were tested using independent sample t-test for continuous scale glucose values and presented as mean with SD. Categorical data were tested using χ2 test. The results were presented with the corresponding 95% CI of the level. P value <0.05 was statistically significant. The numbers of true positive, true negative, false positive, and false negative were estimated with reference to the diagnostic criteria for 2-hour OGTT based on the WHO (≥8.5 mmol/L) and NICE (≥7.8 mmol/L) guidelines. Similar measures were calculated for FPG ≥5.1 mmol/L and ≥5.6 mmol/L in accordance with the WHO and NICE diagnostic criteria. Paired diagnostic accuracy was estimated using standard formulas for disease measurement to evaluate the discriminative, predictive and diagnostic properties of each test. Discriminatory and predictive abilities were determined by test sensitivity, specificity, positive and negative predictive values, diagnostic accuracy, and diagnostic OR (DOR). Higher values indicated better diagnostic properties. To determine overall test performance, the ROC curve was obtained from the raw glucose values. The closer the curve was to the left-hand upper border of the ROC space, the more accurate the test. Test performance was evaluated based on the area under the curve (AUC). Rating ranged from excellent (AUC=0.9–1.0), very good (0.8 to <0.9), good (0.70 to <0.80), sufficient (0.60 to <0.70), poor (0.50 to <0.60) to invaluable (AUC<0.5).23 24 The p value for each variable tested the null hypothesis that the true area under the ROC curve (AUC) is equal to 0.5 (no effect). This correponds to the diagonal where the true positive rate equals the false positive rate. A p value <0.05 indicates that we can reject the null hypothesis, meaning the test is clinically relevant.23 The lower the p value, the better the test performance. Reference cut-offs of each test that provided analogous and clinically useful sensitivity and specificity for the study population were estimated from the coordinates of the ROC curve. Overall, 491 pregnant women aged 15–54 years were screened for GDM between 12 and 20 gestational weeks, while 435 performed the diagnostic tests between 20 and 34 weeks. The 56 fallout was a result of spontaneous abortions, inability to fast overnight and difficulty tolerating the OGTT. The flow of participants through the study, proportions who performed each screening and diagnostic test, and the main reasons for withdrawal from each stage of the screening/diagnosing are shown in figure 1. Flow of participants through the study and the proportions who tested positive and negative to each test. HbA1c, glycated hemoglobin; Neg, negative; OGTT, oral glucosetolerance test; Pos, positive. Presented in figure 2 is a comparison of the GDM positive proportions based on screening and diagnostic outcomes. Per the WHO diagnostic criteria, the prevalence of GDM based on the ‘gold standard’ 2-hour OGTT was 9.0% (n=39, 95% CI 6.5 to 12.0). The prevalence based on FPG was 23.8% (n=106, 95% CI 19.8 to 27.9), whereas based on 1-hour OGTT was 4.5% (n=20, 95% CI 2.7 to 6.7). On the other hand, the NICE diagnostic criteria for 2-hour OGTT yielded a GDM prevalence of 14.3% (n=63, 95% CI 11.0 to 17.5), whereas the diagnostic cut-off for FPG yielded a prevalence of 10.8% (n=48, 95% CI 7.9 to 13.7). Meanwhile, 29.1% (n=130, 95% CI 24.7 to 32.6) had at least one risk factor for GDM. If the WHO 1999 criteria for FPG ≥7.0 mmol/L was in use, the prevalence of GDM would have been 2.7% (n=12, 95% 1.1 to 4.3). Cases of pre-existing diabetes first detected in pregnancy were 2.0% (n=10, 95% CI 1.0 to 3.5). Percentage of participants who tested positive to the screening and diagnostic tests. HbA1c, glycated hemoglobin; NICE, National Institutefor Health and Care Excellence; OGTT, oral glucosetolerance test. Presented in the box and whisker plots in figure 3 are the interquartile values for RBG, HbA1c, FPG, and 1-hour and 2-hour OGTT among participants accessing ANC in primary (n=78) and secondary (n=357) facilities. The solid line represents the WHO diagnostic criteria, whereas the dotted lines represent the NICE diagnostic criteria. In comparison with participants who received ANC from the secondary facilities, participants who received ANC from the primary healthcare facilities had significantly higher mean FPG (4.44±0.98 vs 5.12±0.85 mmol/L), and 1-hour (6.70±1.88 vs 7.20±1.83 mmol/L) and 2-hour (6.24±1.71 vs 6.74±1.72 mmol/L) postprandial glucose. However, no statistical differences were found for RBG and HbA1c values. 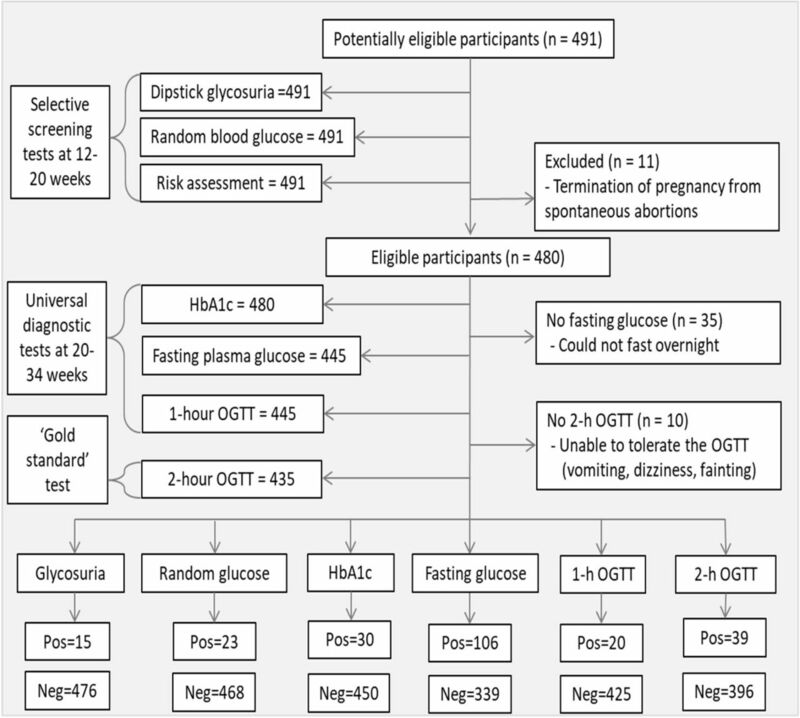 Mean and interquartile glucose values for (A) random blood glucose, (B) fastingplasma glucose, (C) HbA1c, (D) 1-hour OGTT, (E) 2-hour OGTT and (F)triglycerides among participants receiving antenatal care in the primary and secondary facilities. HbA1c, glycated hemoglobin; OGTT, oral glucose tolerance test; solid line, WHO criteria; dottedline, the NICE criteria. Overall, the mean 1-hour postprandial glucose (7.2±1.8 mmol/L) was 0.5 mmol/L higher than the 2-hour postprandial glucose (6.7±1.7 mmol/L). Also, the mean random blood glucose (5.4±1.1 mmol/L) was 0.3 mmol/L higher than the FPG (5.1±0.9 mmol/L). Breakdown of the diagnostic-positive, screen-positive, and risk factor-positive proportions among primary and secondary facility users is presented in table 1. Even though GDM tended to be more prevalent among primary healthcare users, no significant differences existed except for the prevalence based on FPG and HbA1c. Regarding risk factors, first trimester obesity was found to be significantly higher among participants attending the secondary-level facilities. Table 2 shows the diagnostic accuracy of the test instruments with reference to the ‘gold standard’ 2-hour OGTT and FPG estimated based on the WHO and NICE cut-offs. Generally, the screening tests had low sensitivity and positive predictive value (PPV), whereas their specificity and negative predictive value (NPV) were relatively high. Using the WHO diagnostic criteria for 2-hour OGTT as reference, FPG ≥5.1 mmol/L had the highest sensitivity (68%) and NPV (96%). However, 1-hour OGTT had the highest specificity, PPV (75%) and DOR. Glycosuria, HbA1c and RBG were the least sensitive (<15%) and hence yielded a clinically irrelevant specificity >95%. Although the presence of at least one risk factor was 54% sensitive, its accuracy was the least among the test instruments (≈70%). Similar pattern was observed when the NICE diagnostic criteria for 2-hour OGTT (≥7.8 mmol/L) was used as the reference. But here the test instruments had relatively lower sensitivity and DOR. Using the WHO diagnostic criteria for FPG (≥5.1 mmol/L) as the reference yielded generally lower diagnostic measures. 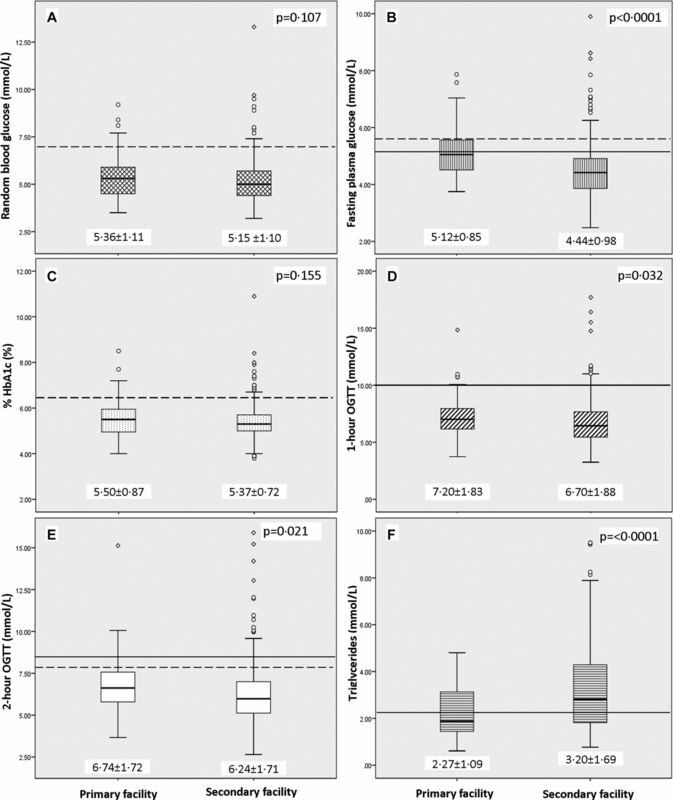 Here, 2-hour OGTT ≥7.8 mmol/L had the highest sensitivity and NPV. This was followed by risk factors with a sensitivity of 32%. However, the 1-hour OGTT ≥10.0 mmol/L had the highest PPV and DOR. When the NICE diagnostic criteria for FPG (≥5.6 mmol/L) was used as the reference, sensitivity of the test instruments was slightly higher. If selective screening based on trace/above glycosuria was used, only 3.2% would have performed a diagnostic test for GDM. Out of this total, only 2.6% would be positive if the test of choice was 2-hour OGTT. Should glycosuria cut-off be changed to 1+ and above, screen-positive would have further declined to less than 1% and none of the participants would have needed a diagnostic test. If selective diagnostic testing based on RBG >7.0 mmol/L were used, only 4.8% would have performed a diagnostic test for GDM, out of which 12.8% would have tested positive. If selective diagnostic testing based on the presence of at least one risk factor was used to inform diagnostic testing, 29.1% would have performed a diagnostic test, out of which 53.4% would be positive. Figure 4 presents the ROC curves showing the AUC as indication of test performance. Interpretation of the ROC curves is presented in table 3. In figure 4A and B, the reference test was 2-hour OGTT based on the WHO (≥8.5 mmol/L) and NICE (≥7.8 mmol/L) guidelines. Here, we observed that the 1-hour OGTT and FPG were very good tests as the AUC was between 0.88 and 0.86. Random blood glucose was a poor test for detecting GDM (AUC≈0.6), whereas HbA1c was invaluable because the AUC was <0.5 and the CI of the AUC was statistically insignificant (p=0.686). In figure 4C and D, FPG≥5.1 mmol/L and ≥5.6 mmol/L were used as the reference test. Here, 1-hour and 2-hour OGTT were found to be ‘good’ test because the AUC was between 0.76 and 0.78. Although AUC values for RBG and HbA1c were slightly higher when compared with figure 4A and B, the test rating was similar as when the 2-hour OGTT was used as the reference. Receiver operating characteristic analyses showing area under the curves with reference to 2-hour OGTT (A,B) and fasting plasma glucose (C,D). HbA1c, glycated hemoglobin; OGTT, oral glucosetolerance test. Finally, from the coordinates of the ROC curve where 2-hour OGTT ≥8.5 mmol/L was the reference, we estimated the diagnostic thresholds for the study population that provided optimized and clinically relevant sensitivity and specificity. A random blood glucose threshold of 5.2 mmol/L corresponded to a sensitivity of 60% and specificity of 54%. Similar sensitivity and specificity (62% vs 41%) were obtained for the HbA1c threshold of 5.2%. Increasing the sensitivity of both RBG and HbA1c to 70% corresponded to thresholds of 5.0 mmol/L and 5.0%, respectively, but the specificity of both was not clinically relevant (38% vs 25%). Regarding fasting glucose, 90% sensitivity and 72% specificity corresponded to 4.8 mmol/L. At the same threshold, the NICE criteria (2-hour OGTT ≥7.8 mmol/L) yielded 80% sensitivity and 74% specificity. In the case of 1-hour OGTT, 7.8 mmol/L threshold corresponded to 82% sensitivity and 81% specificity. 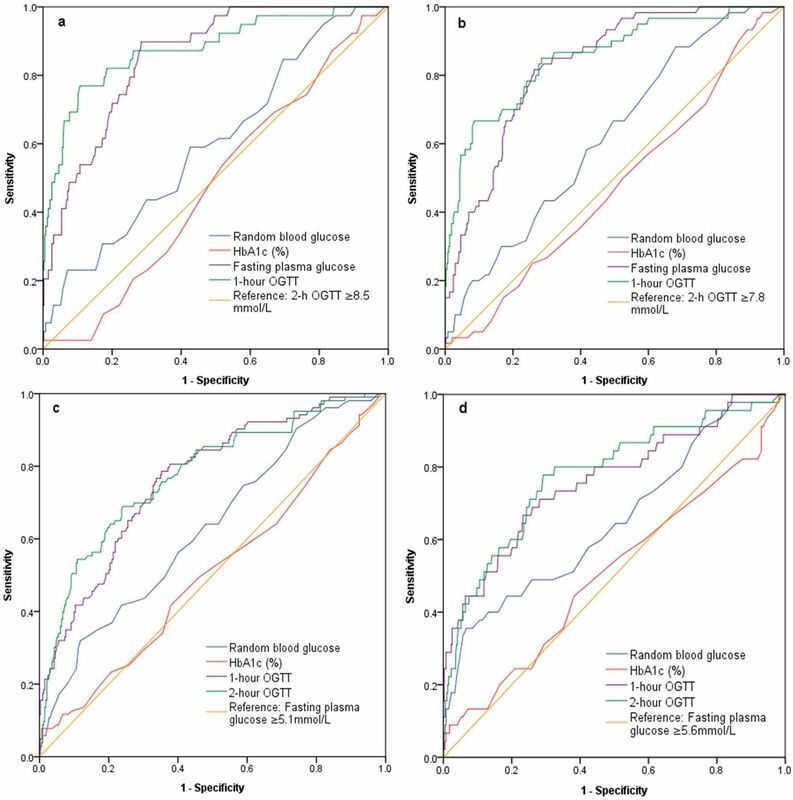 Through this diagnostic accuracy study, we found that GDM prevalence from 2-hour OGTT (9.0%) was similar to the 9.3% recorded in a tertiary facility in Ghana in 2015.16 Glycemic values of primary healthcare users tended to be higher. Although the presence of at least one risk factor for GDM had the least specificity, it was a more sensitive screening tool for the condition compared with glycosuria and random blood glucose testing. Regarding diagnostic tests, FPG had more clinically useful sensitivity and specificity, while 1-hour OGTT had the highest specificity, DOR and AUC. It has been established that during pregnancy, renal glucose threshold is highly variable with a reduction in glycemic thresholds needed for the diagnosis of gestational diabetes,26 while there is possibility of asymptomatic hyperglycemia without detectable glycosuria.18 Often, glycosuria and proteinuria are checked simultaneously using a single test strip and provide vital basis for detecting pre-eclampsia as well. Hence, the test is cost-effective despite its associated limitations. In primary healthcare settings where glycosuria testing is predominant, clients with trace results should be closely monitored and possibly booked for diagnostic testing if trace result is obtained on more than one occasion. But it is important that the diagnostic decision for GDM does not rely on the presence of glycosuria because it is highly insensitive and has a very low DOR. HbA1c test had the highest number of false negative and least DOR, and the test performance was diagnostically invaluable. As pregnancy progresses, HbA1c levels decrease27 as a result of factors such as increased red cell turnover, hemoglobin variations and iron deficiency anemia,28 which is a major public health problem in Ghana. This might explain why our mean HbA1c was 5.5%, similar to the 5.3% reported in South African.7 HbA1c provides information about 3-month glycemic control. Values >6.5% at first prenatal visit are suggestive of overt diabetes.9 However, in deprived populations where over 90% of pregnant women are unaware of their prepregnancy glycemic status and half make their first ANC visit after the first trimester, it is difficult to delineate pre-existing hyperglycemia from pregnancy-induced diabetes. Considering the limited availability of HbA1c testing, its high cost (approximately $15 equivalent in Ghana) and the lack of correlation between HbA1c and average blood glucose due to gestational metabolic alterations,29 the use of HbA1c as a routine GDM detection tool in resource-constraint settings is unnecessary at the population level. Although the diagnostic accuracy of random blood glucose was poor, its accuracy was better than glycosuria and HbA1c. Interestingly, the mean RBG was only 0.3 mmol/L-point higher than the mean FPG. In our study setting, care seekers typically attend healthcare facilities in fasting state in anticipation of service providers unexpectedly requesting a biochemical test that might require overnight fasting. Also, long waiting times and high clientele turnout often compel clients to skip breakfast or eat meals typically smaller than usual in order to arrive early at the hospital and thus minimize delays. Meanwhile, the effect of pregnancy-related physiologic changes altering dietary patterns and preferences cannot be ruled out.27 No wonder the highest sensitivity and specificity for RBG were at the 5.2 mmol/L threshold. RBG using capillary finger prick checked on a glucose meter is cheap and can be done by low-cadre health workers with minimum training, thereby making it the test of choice in primary healthcare care settings. However, none of the health regulating bodies have established a diagnostic threshold for this test, although NICE recommends RBG >7.0 mmol/L as an indication for OGTT, while WHO/IADPSG recommend >11.1 mmol/L as diagnostic of clinical (overt) diabetes. This >11.1 mmol/L cut-off would have yielded only one positive case in this study. Due to non-consensus on diagnostic threshold for RBG, and the test not being sufficiently sensitive to detect GDM, the effectiveness of RBG needs to be further explored with emphasis on the reference threshold and optimum postprandial conditions under which the test would be most accurate. FPG had the highest true positive rate and the test performance was very good, thereby making it useful for ruling out GDM and minimizing missed cases. In the USA, FPG reduced 7% missed cases when used as a screening tool.30 The test has an added advantage of being readily available, easy to perform, relatively inexpensive, requiring minimal client preparation and is applicable for both GDM screening and diagnostic purposes. 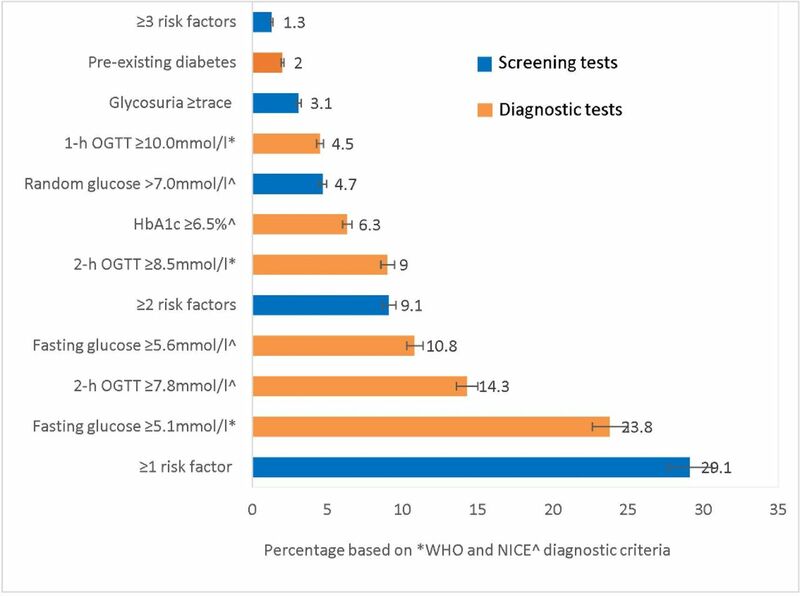 When assessing diagnostic accuracy, tests with high discriminatory measures are helpful in screening and making health policy decisions, whereas highly predictive tests are useful in predicting the probability of the disease at the individual level in order to facilitate client-centered case management.23 The NICE cut-off (≥5.6 mmol/L) had higher PPV, thus making it the test and cut-off option for predicting the probability of GDM in an individual. The WHO cut-off (≥5.1 mmol/L) was the most sensitive but has the potential for overdiagnoses due to the high number of false positives. Nonetheless, its high sensitivity makes it the test of choice if prevention of missed cases is the focus. Even though WHO,10 IADPSG,12 and NICE9 have established FPG as a diagnostic test for GDM, the preferred test is the ‘gold standard’ 2-hour OGTT. The criteria for diagnosing diabetes in pregnancy based on the 1-hour postload value have not been fully established,10 and we have found its sensitivity to be <50%. Therefore, in settings where 2-hour postprandial glucose-load testing is unavailable for confirmation, GDM diagnosis and decision to commence therapy should be established based on preprandial glucose values ≥5.6 mmol/L as substitute for an OGTT. This should be complemented by the presence of risk factors. In the wake of updated guidelines for detecting hyperglycemia in pregnancy whereby diagnostic thresholds have reduced,9–12 there are widespread concerns about overdiagnosing and the associated implications particularly for fragile health systems. Nonetheless, evidence of increasing prevalence of pregnancy-triggered diabetes from negligible rates to almost 30% in certain settings in African5–7 necessitates a critical review of diagnostic strategies by health systems if adverse outcomes such as newborn macrosomia, hypoglycemia, hyperinsulinemia, respiratory distress, perinatal mortality, maternal pre-eclampsia, cesarean delivery1 and risk for long-term metabolic conditions3 are to be reduced. Our study is not without limitations. Although HbA1c was performed in the fasting state (n=445), few non-fasting pregnant women (n=35) were included. Nonetheless prandial state has been shown not to affect HbA1c levels. Whereas random blood glucose was checked from capillary finger prick before 20 gestational weeks, FPG was checked from venous blood from 20 to 34 weeks. Variability in sampling collection procedure and testing times poses a challenge when equating these two glucose values. Because pregnant women also receive ANC in primary facilities where laboratory services could be unavailable, accuracy of point-of-care testing using fasting whole blood glucose obtained from a capillary finger prick should have been investigated as well. Despite these limitations, unlike in most diagnostic accuracy studies where retrospective data sources were used, our study was conducted prospectively using the blind comparison with a gold standard design, a type of randomized controlled trial design that compares the accuracy of diagnostic procedures in the same individual. This design increases the probability of the test outcomes being close to the true values. In low-income and middle-income countries, studies of this nature are mostly concentrated in tertiary hospitals. Our study shows higher glycemic values among primary healthcare users. This provides evidence of obstetric transition even in rural communities and highlights the need to enhance access to quality maternal healthcare at primary healthcare levels. Gestational diabetes is common in the study population and was high among primary healthcare users. In as much as overdiagnoses (false positive) will increase costs, underdiagnoses (false negative) have adverse public health implications. Selective screening using risk factors is better compared with glycosuria and random blood glucose because these tests missed majority of cases, thereby decreasing opportunities for diagnostic testing. Because FPG was the most sensitive test with minimal false negatives diagnoses, its integration into all GDM detection procedures through universal testing of all pregnant women is recommended as it is easier to accomplish for many women compared with OGTT. At the population level, the WHO diagnostic criteria ≥5.1 mmol/L could be useful for screening purposes because of its discriminatory properties, a key consideration for making health policy decisions. At the individual level, the NICE diagnostic criteria ≥5.6 mmol/L, which has higher GDM prediction properties, could be useful in making therapeutic decisions. In settings where 2-hour postprandial OGTT is difficult to obtain, fasting glucose value ≥5.6 mmol/L should be complemented with risk factor assessment and collectively serve as the basis to commence treatment. We appreciate the staff of the University of Health and Allied Sciences Research Laboratory in Hohoe particularly the head, Ms Joyce Der, presently at the London School of Hygiene & Tropical Medicine, for supervising the laboratory work, and Mr Clifford Agbazo, a biomedical scientist, for his technical and analytical support. Thanks to the midwives, nurses and gynecologists at the antenatal clinic, labor ward and postnatal clinic of the study facilities for their support. We also thank Samuel Darrah and Philip Kofie, our field assistants, for helping with data collection. NICE. Diabetes in pregnancy. Management of diabetes and its complications from preconception to the postnatal period. NICE guideline 3 Methods, evidence and recommendations . London, UK: National Institute for Health and Care Excellence and National Collaborating Centre for Women's and Children's Health, 2015.
WHO. Diagnostic criteria and classification of hyperglycaemia first detected in pregnancy . Geneva, Switzerland: World Health Organization, 2013. Ministry of Health. Standard treatment guidelines. Ghana National Drugs Programme (GNDP) . 6th edn. Accra, Ghana, West Africa: Yamens Press. Ltd, 2010.
. No need for glycosuria/proteinuria screen in pregnant women. J Fam Pract 2005;54:978.
. STARD 2015: an updated list of essential items for reporting diagnostic accuracy studies. BMJ 2015;351:h5527. Ghana Statistical Service. Population and housing census. regional analytical report, volta region. Accra, Ghana Ghana Statistical Service 2010;2013:1–153.
. Sampling techniques . US: John Wiley & Sons, 2007. Contributors FA and AJ conceived the study concept, and AA contributed to the planning, design and development of data collection instruments. FA and AA acquired the data. FA and CN managed and analyzed the data. All authors contributed to the interpretation of the results. FA drafted the manuscript, and all the authors critically revised it for important intellectual content. Ethics approval Ethical approval was granted by the Ghana Health Service Ethics Review Committee and the Institutional Review Board of the University of Heidelberg under the protocol identification numbers GHS-ERC-GM 04/02/16 and S-042/2016. Assent was not obtained for pregnant teenagers because they were regarded as emancipated adults. Data sharing statement This study is part of a larger prospective cohort study aimed at assessing the effects of hyperglycemia in pregnancy on maternal, fetal and neonatal outcomes and the extent of normoglycemia in the short-term period after delivery. Both data collection and data analysis are still ongoing. Hence the authors are unable to publicly share the data sets generated.